American violinist, Jae Cosmos Lee, who’s performances have been acclaimed as “Delicate and beautiful” (Syracuse Post-Standard) and “Bursting with color” (Boston Globe), is Concertmaster of the Cape Symphony (Cape Cod, MA), and co-founder of A Far Cry, the Grammy nominated, resident chamber orchestra of the Isabella Stewart Gardner Museum in Boston. He is also Curator & Director of the Nth Degree Chamber Music Series based in Falmouth, MA, first violinist of the Boston based Pedroia String Quartet and the Associate Concertmaster of the Boston Philharmonic Orchestra. Jae has been a guest artist with the Audubon, Borromeo and Jupiter String Quartets, Pittsburgh New Music Ensemble, ECCO, Boston Musica Viva, Sound Impact, the Firebird and Radius Ensembles, and has performed in concert halls throughout Europe, the United States, Canada and Asia. He is a recipient of numerous awards and honors, and has performed in many of the finest music festivals including Apple Hill, Aspen, Chautauqua, Norfolk, Sarasota, Vail, Banff, Seoul, Scotia, New South, Skaneateles, Salzburg, Ottawa, Prussia Cove and Kneisel Hall. 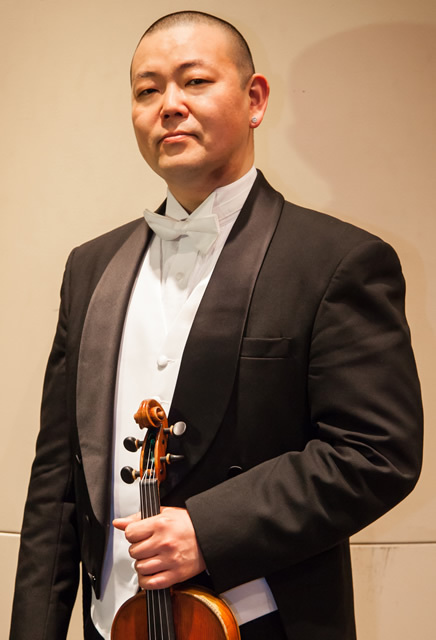 Jae has worked closely with the members of the Cleveland, Juilliard, Takács and Tokyo String Quartets and holds degrees from the University of Michigan, Ann Arbor, the Cleveland Institute of Music, and the New England Conservatory. His performances have been heard widely on American Public Media’s Performance Today, Boston’s WGBH and New York’s WQXR, along with public radio stations across Georgia, Maine & Vermont.